If BlackBerry owners are given a choice between $250 towards a new BlackBerry(s bbry) or $200 towards any other smartphone, what do you think will happen? 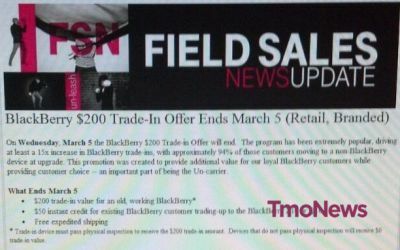 Apparently, even the most loyal BlackBerry fans will go for the offer that pays less cash and jump ship. That’s exactly what happened with a recent T-Mobile offer according TMo News, which has an alleged internal memo showing the results of a T-Mobile(s tmus) BlackBerry promotion. According to the memo, BlackBerry trade-in volume jumped 15x while 94 percent of those trades led to customers choosing non-BlackBerry mobile phones. After word of the blog post got to T-Mobile CEO John Legere, he assured Chen and BlackBerry owners that the team would come up with something to address the situation. That “something” was the promotion that actually paid BlackBerry owners more to stay with the brand than to switch. Although it didn’t pan out the way he might have liked, Chen got what he wanted. So too did 94 percent of the BlackBerry owners that took advantage of the deal as they got away from an eroding mobile platform. Not only did TM stores have little if any BB inventory, the horror stories of sales reps’ ignorance of (and subsequent hindrance to) the deal abound Just another example of how stats taken out of context prove nothing. BB must die. The sooner is the better. T- Mobile has even this website fooled. Unreal. I thought you guys were smarter than this. First of all, T- Mobile only carries refurbished Z10’s and Q10’s. REFURBISHED! Second, you can’t even find them in most of the stores. Third, 94% of what number? Is it 10, 20, 30? Them refusing to give this actual number speaks volumes. BB10 is nothing like BB7. Hopefully Mr, Chen (the new ceo) can make some head way in this regard. Anyways, don’t fall for these tactics by T-Mobile. Does TMo even stock BBs in their stores? I was in a TMO store the other day and I don’t recall seeing any BBs. If they don’t, I can understand the low take rate, also because of the competition. I have a Z10 in my current two phone rotation (nexus 4 being my other phone) and I love the gesture UI and design. Apps are an issue, but for me the biggest issue is I love being able to customize my phone. That’s one of the reasons why I switched from an iphone. I ditched my 10 year love of Blackberry for an iPhone in November. Had I held out I could have made a bit of extra money. :) But as much as I miss the physical keyboard, I don’t miss having to constantly do battery pulls and deal with a lack of applications. BB10 devices are a completely different story. I love my Z10. I have tons of apps and games, some of which are Android apps. The overall experience is great, especially with 10.2.1 (which of course isn’t out in the US yet). It was obvious that T-Mobile’s deal would promote a switch. Users that had legacy devices might not know that BB10 is different and far better than their previous experience in many ways. They know what is popular and Android and iPhone are pushed by the carriers. In fact, people are actively dissuaded from choosing BlackBerry (their new devices included). To compound the issue with T-Mobile, they were only offering refurbished devices initially, and I think only the Q10. I think BB needs to not rely on the carriers, because they are two-faced (T-Mobile in particular). BB should have offered a promotion direct to its users to get them to switch to a BB10 model.